The elegant Balcon restaurant at Sofitel St James is modeled on a traditional French brasserie and serves a French menu founded on classic principles, but with a modern twist. With its exquisite décor, The Balcon is ideal for lazy breakfasts, power lunches, intimate dinners or even a drink after work. What’s more The Balcon also serves afternoon tea. But if you are angling for afternoon tea at Sofitel St James, then I would thoroughly recommend the Rose Lounge at the hotel as it is a truly beautiful spot (you can read about their afternoon tea experience here). But back to The Balcon. 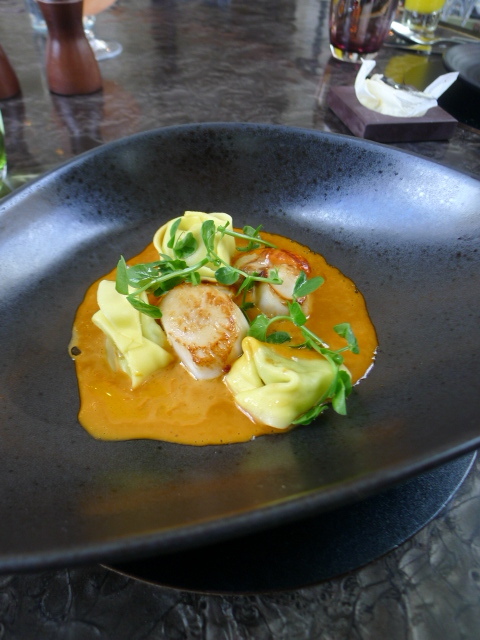 We began our leisurely lunch with a gorgeous starter of grilled scallops, pea tortellini and lobster sauce (£12). The scallops were nicely cooked and had a nice level of caramelisation on it. The tortellini was well made. But it was the lobster sauce which was the winning element of the dish. Offering a rich lobster flavour, It was creamy, decadent and showed off real class. 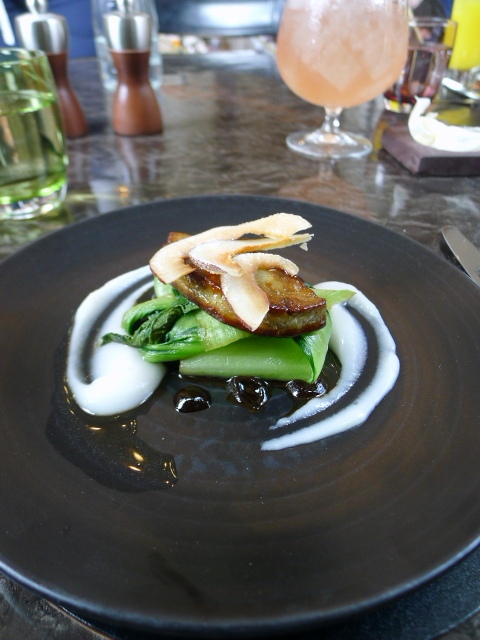 Seared foie gras, pak choy, coconut, black garlic, oyster sauce (£13) proved to be an unusual combination. The foie gras was tasty, but I would have enjoyed it more if it had been a little fattier. All the accompaniments were in themselves pleasant, but a little more sweetness running through the dish might have worked better. A main of lobster and seafood bouillabaisse with braised fennel and rouille (£24) was absolutely delicious. Containing a combination of wonderfully fresh lobster claw, mussels, salmon and hake, each of the seafood elements had been perfectly cooked. 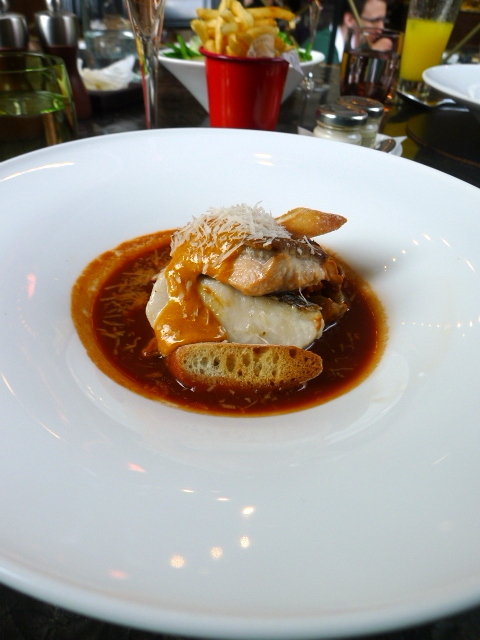 The flavour of the bouillabaisse base was also lovely. A very tasty dish indeed. 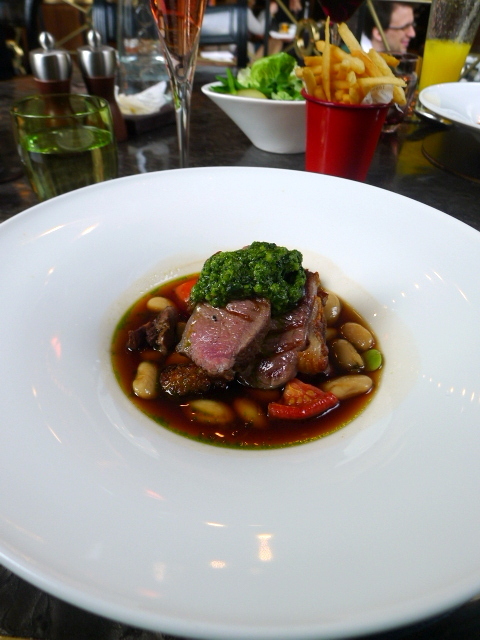 Elwy valley lamb sirloin (£23) came out more medium than medium rare. There was a good flavour running through the lamb, but it was ever so slightly chewy. Also in the dish were some lovely accompaniments of kidney, sweetbread, broad beans, white beans and a scrumptious wild garlic pesto which really gave the dish a nice lift. 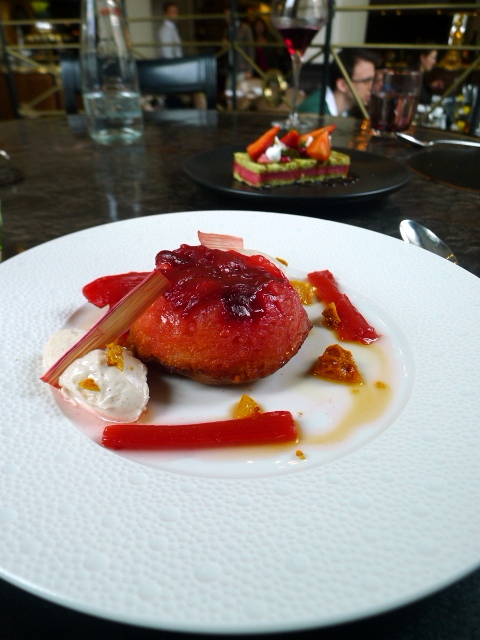 The first of our desserts was a rhubarb and stem ginger steamed pudding with cinnamon mascarpone and honeycomb (£7). It offered an impressive finish to the meal as the pudding was moist and lovely. The rhubarb worked a treat with its hint of sharpness, the mascarpone was wonderful and warming, and the honeycomb added a nice crunchy texture to the dessert. 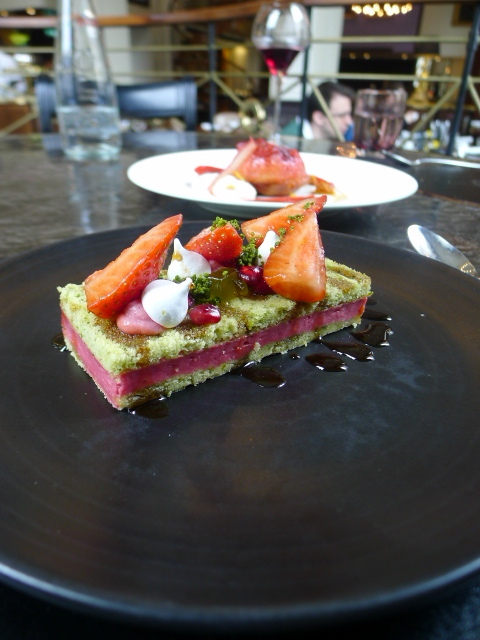 Less impressive was the pistachio sponge sandwich with pomegranate molasses and topped with strawberries and meringue (£7). It wasn’t a bad dessert, but the sponge was a little dry and I found the overall result to be a little too sweet. The Balcon proved to be a solid, enjoyable experience. The cooking was well executed with flourishes of excellence, particularly the seafood dishes. The service was slick and professional with a welcoming charm. And so The Balcon definitely deserves a place as one of the more respectable classical French restaurants in London. 1) The scallop dish, particularly the lobster sauce. 4) Overall, a really lovely experience. Average Price: £31 to £47 for three courses, excludes drinks and service. The Balcon also offers a reasonable £25 three course menu. Love your blog! And the pictures are all so perfect! Thank you! Your blog is pretty cool too. Your visit to Cancun looked amazing.